Bill Goode received two obituaries- in the Times and EDP (Eastern Daily Press). William Goode, round tower specialist, was born on June 6, 1912. He died on January 27, 2008, aged 95. English round towers expert who climbed them into his eighties, no one knew more about the round towers of England than William (Bill) Goode. He studied them from boyhood until well into his nineties, founded the Round Tower Churches Society and campaigned to save those in danger of collapse. His greatest interest lay in dating Norman and Saxon towers. Born in Ealing, West London, Goode left school at 14 and eventually kept a pork shop at Lowestoft in Suffolk, which his wife, Ada, ran while he served in the Second World War. A wireless operator/gunner, he landed with the 1st Army at Algiers in November 1942 and joined its advance towards the 8th Army that was moving from El Alamein. He later fought in Italy. After the war Goode returned to pork retailing, then worked at the Pye radio factory in Lowestoft. As a boy he liked to take pictures of windmills and castles with an early box camera and soon after the war he specialised in round towers. On retirement from work, round towers became his full-time hobby. He climbed towers into his eighties. Heights did not bother him and he managed to get to the top of most, daunted only by rickety ladders and rotten floorboards. One of the most difficult parts of the climb was lifting the heavy trap door to the highest part of the tower while balancing on a ladder. More than once Goode had to climb over a bell frame to get to the next stage. His theory, after years of compiling data, was that most round towers were Saxon in origin, despite the presence of Norman architectural features, which he thought were added after the Norman Conquest. Travelling around the country in an ancient Volkswagen Beetle, he carried a 19ft ladder on the roof rack, a torch, tape recorder, tape measures, cameras that coped with close-range elevations and clothes lines for measuring heights. These were the tools of his passion. The Round Tower Churches Society has almost 600 members and the Prince of Wales is its patron. 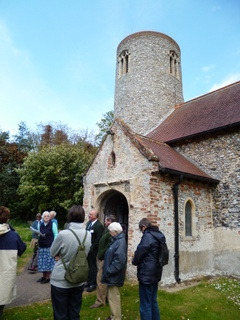 Its members enjoy visiting round towers but the organisation also encourages more profound research into furthering the understanding of this aspect of church architecture. Over the years it has given more than £60,000 in grants to these special churches, an amazing achievement for so small a society. Goode founded it in 1973 and retired as its president last year. Goode’s book Round Tower Churches of South East England is thought to be among the most comprehensive volumes of its kind. 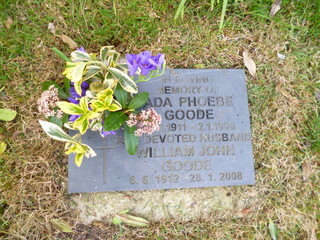 Goode’s wife died in 2001; their only child, a son, in 1996. Round tower church enthusiast Bill Goode, who campaigned to safeguard a key element of the region’s heritage, has died aged 95. 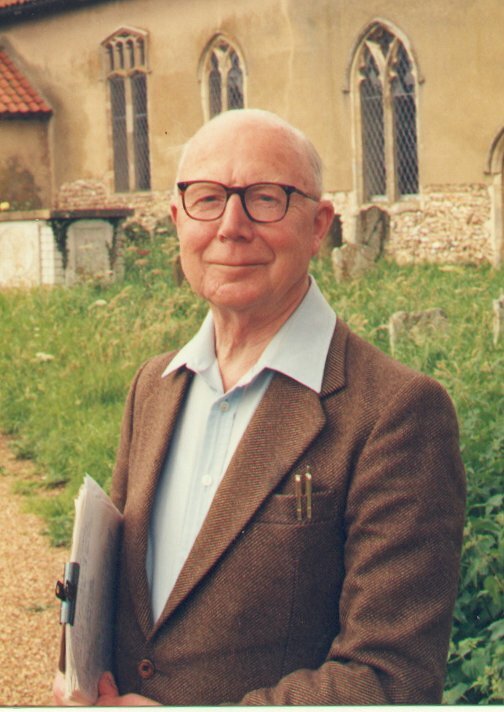 He spent more than five decades studying round tower churches and published a number of books on the subject, which helped to raise their profile to a wider public. In 1973, he founded the Round Tower Churches Society, which today enjoys the patronage of the Prince of Wales, and now has a national and international membership of more than 600. In the past three decades, the society has donated more than £60,000 towards church restoration projects. Born in Ealing, London, he left school at 14 and then spent the rest of his life in Lowestoft, where he started work as a pork butcher. While he was on war service as a wireless operator/gunner, seeing action in North Africa and later Italy, the shop was run by his wife, Ada. Later, he also worked as a television engineer at town’s former Pye factory until 1975. Self-taught, he studied the architecture. Then, using £2,000 of his life savings, he published a book, East Anglian Round Towers and their Churches in 1980. It was a financial success and went on to make £3,000 profit. This was ploughed into the society by its president, who retired only last year. As a result of 17 years of research into round towers, including 130 in Norfolk and 42 in Suffolk, he concluded that most dated from Saxon times and were pre-Norman Conquest. It was a controversial finding, which generated much debate and dispute among academics over the following years. However, his enthusiasm encouraged others to research and study round tower churches. A leading author and expert on church architecture, Stephen Hart, said that the society would remain a living memorial to its enthusiastic founder. Mr Goode, who wrote a number of other publications including Round Tower Churches of South East England, rejected the view that round towers were originally built as defensive watchtowers and the churches were added later. The design of the towers was a result of the lack of dressed stone to provide stone corners. He surveyed churches using a simple plumb line of his invention and with his late wife travelled thousands of miles in an orange Volkswagen Beetle, complete with 19ft ladder on the roof. His wife died in 2001 and his son also predeceased him but he leaves a daughter-in-law and grandchildren. His funeral took place earlier this month. Copyright 2008. Archant Regional Limited. 2013 AGM was at Gunton (Bill and his wife Ada’s local church) to celebrate the 40th anniversary of the setting up of the Society. Bill and Ada’s memorial, carefully tended by the churchwardens who welcomed us to their church for our AGM. Lowestoft Museum has a permanent display of photographs, originally set up by Bill Goode. The museum is in Nicolas Everitt Park, Oulton Broad, Suffolk and is open every afternoon from 1pm to 4pm during the summer.